Let us not forget this magnificent movement that Sankyo has produced. This is Handel at his best. 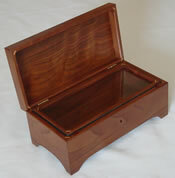 Each of the three pieces are stately and yet very charming. If you have ever heard the original piece of music, you can almost hear the trumpets playing although you are only hearing a music box at the present time. Perhaps you are hearing a harp. What ever the case, don't let this movement pass you by. 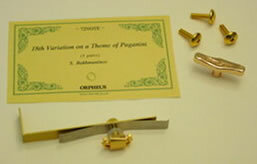 This kind of Sankyo movement plays two or three tunes (or parts) and is made in Japan. Playing time is usually about 6 minutes. There are 72 notes (or "teeth") on the comb. There is a lot of bass sound in the comb, and the arrangements are usually very spectacular in nature. Our in-house comb machine and Rick's expertise result in Bell-Like Tuning unrivalled in new movements for decades. "…I can recommend them wholeheartedly…"
1. 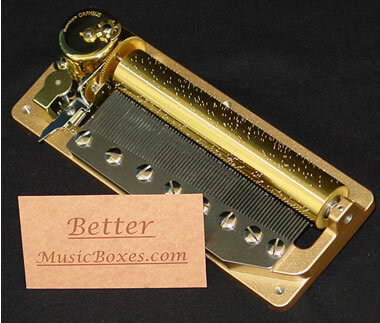 If you buy one of our large music boxes together with one of our movements, we will install the movement free of charge. 2. If you buy just the movement, it ships complete with winding key, mounting screws, operating lever, an attractive tune label, and an accurate drilling template. For box-building details, refer to our Box Design & Installation Considerations. We also stock 15mm (just over 9/16) long key extenders (necessary for box bottoms thicker than 3/8 - which we do not recommend). These are only available with the purchase of a movement. Contact us for details. All tune arrangements are copyrighted by Nidec Sankyo Corp. except drum codes beginning in “BMB” which are copyrighted by BetterMusicBoxes.com.